BBQ season is upon us! Will you have a vegetarian to feed in your group? Often meatless patties are dry and disappointing, especially the ones that come packaged from the grocery store. Veggie burgers are so easy to make in your home kitchen, requiring fairly minimal forethought and prep work. 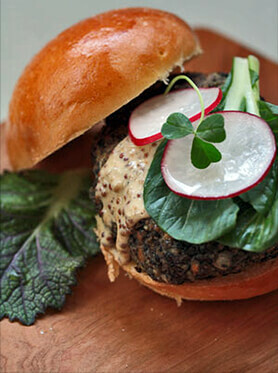 Here is a unique idea to impart a tea flavor into a vegetarian burger. This recipe combines the earthiness of Arbor Teas Organic Yerba Mate with a bit of smoke from Organic Russian Caravan Black Tea. The lentils are cooked directly in the steeped teas, gaining an extra boost of flavor as they soak up the liquid and soften. Black beluga lentils retain their shape fairly well when cooked, so they are worth seeking out. Other varieties may cook up too mushy, causing the patties to fall apart. Pour boiling water over tea leaves in a medium bowl. Cover and steep for about 4 minutes, then strain tea into a large saucepan, discarding tea leaves. Add the lentils to the sauce pan and bring to a boil over high heat. Lower the heat to a simmer and cook until most of the liquid is absorbed and the lentils are firm but tender, about 30-40 minutes. Cover the pan and let rest it rest off heat, until remaining liquid is absorbed, about 10 minutes. In the bowl of a food processor, combine the lentils, eggs, and salt. Pulse until the mixture becomes a thick paste, allowing some lentils to remain whole. Transfer the lentil mixture to a mixing bowl and stir in the onion, shredded carrot, and garlic. Next add the breadcrumbs and stir to combined. Let rest for a couple of minutes to allow the bread crumbs to absorb some of the moisture. Divide the mixture into 6 equal portions and form into 1½-inch-thick patties. Grill for 5-8 minutes on each side until browned and crisped on both sides. Alternatively, if cooking indoors, heat the oil in a heavy skillet over medium low, add the patties, cover, and cook for 7 to 10 minutes, until the bottoms begin to brown. Flip and cook the second side for 7 minutes, or until golden.